Are you in the market for a Gulf Shores family beach photographer? Every beach vacation needs a vessel to remember the trip by. We ask each of our clients, what will they remember? The answer is simple with us, every single little detail. We strive to make our photography so great that a picture can take you back to that exact moment in time, so well that you actually can still smell the salt air. Some say a picture is worth a thousand words, and we feel this saying holds true. We want you to remember your trip to the beautiful beaches of Gulf Shores, and we want to be your professional photographer every single time you visit. We have had perfect weather this week and enjoyed another beautiful sunset session last night. Our family had a great time, and the girls loved their photo session. Not only did we accomplish our mission of perfect family beach portraits, we saw dauphins and possibly even a tail of a mermaid. The girls had such a grand time with that one, I am positive they will probably spend every last minute of their beach time spying for more mermaids, haha. 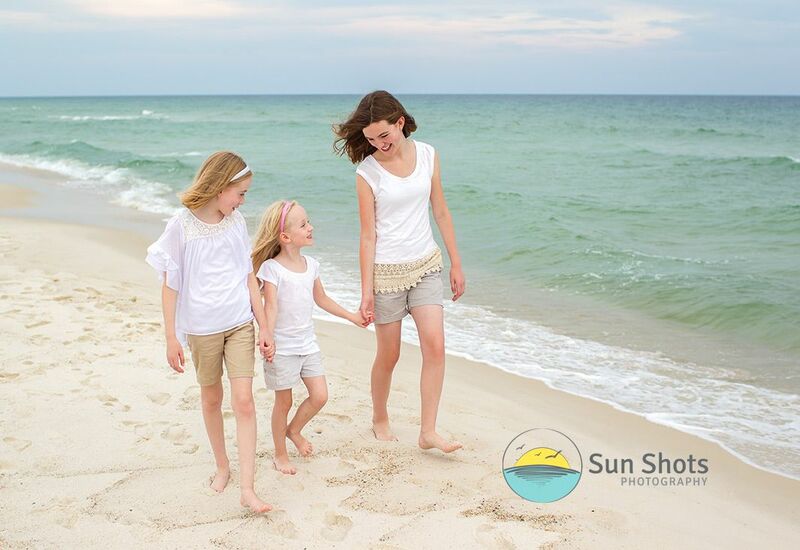 Thanks, girls for trusting Sun Shots photography for your family beach portraits. We really enjoyed meeting your family, and can't wait to see you again in a few years when you return.